Non Bai Tho, the traditional Vietnamese conical hat is crafted with poems weaved into the design and viewed when held up to the light. Similar, but without the poem, are Non La. 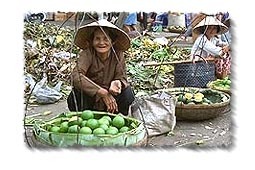 These practical lightweight hats and often worn in Hue and virtually everywhere else outside Hanoi and Saigon. Spend a day on a river in the Mekong Delta and you'll understand why! A Non La is great protection from sun and rain.